Last week we set aside some time to get together and chat with a couple other local bloggers from Feather and Mane. Jessica and Carla are a sister duo who run Feather and Mane - a blog focused on ethical shopping and purposeful living. We loved hearing about their passions, interests and some exciting upcoming events and giveaways they are hosting in the future! We gathered together around a beautiful spread of local food. Shopping local is something that does not always come naturally to us, but we are becoming more and more aware of the importance of shopping local. We started by looking for local companies that did not add extra preservatives to their fresh foods. We discovered Heritage Meats who made gluten free pepperoni sticks and sugar free BACON! Yes, BACON (So delicious). 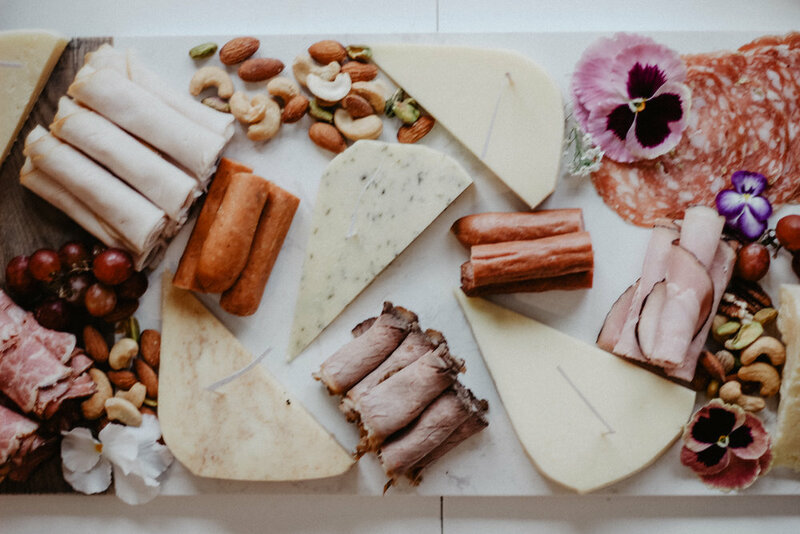 For our local night, we created a beautiful charcuterie board featuring all local meats from Heritage Meats in Langley. We are frequent shoppers, as they make all of their meats in-store or from local farms in the area - plus, my children love the mini shopping carts! We sampled corned beef, black forest ham, roasted turkey, roast beef, salami, and they were all delicious. To pair with our meats, we sampled a variety of locally made cheeses from Golden Ears Cheesecrafters in Maple Ridge. First off, their storefront is adorable, complete with a little cafe you can order freshly made sandwiches, baked goods and soups. They carry so many products from local companies such as homemade pies, fresh meals, jams, crackers, breads, olive oils etc. We tasted a variety of cheeses during our evening including Smoked Gouda, Aged Cheddar, Gouda Onion Garlic, Havarti Chipotle, Neufchatel Herb and Garlic and Charmesan. They were all so delicious and packed with so much flavour. We even picked up a couple bags of fresh cheese curds to make some homemade poutine one day! To end our evening, we sipped on Tea and enjoyed a fresh goodie from our new favourite bakery, The Polly Fox in Abbotsford. We recently discovered this bakery driving by one day and randomly stopped in. Everything is made in house and is Gluten-Free. More importantly, their food is delicious! We were blown away by the flavour in their apple fritters, donuts, banana bread, nanaimo bars and cashew bars (Those are just some of our favourites!). You can also order a gluten free meal such as a sandwich or pizza at their bakery as well. The Polly Fox is run by two sisters, and they have poured their heart and soul into making so many tasty treats for everyone to love. 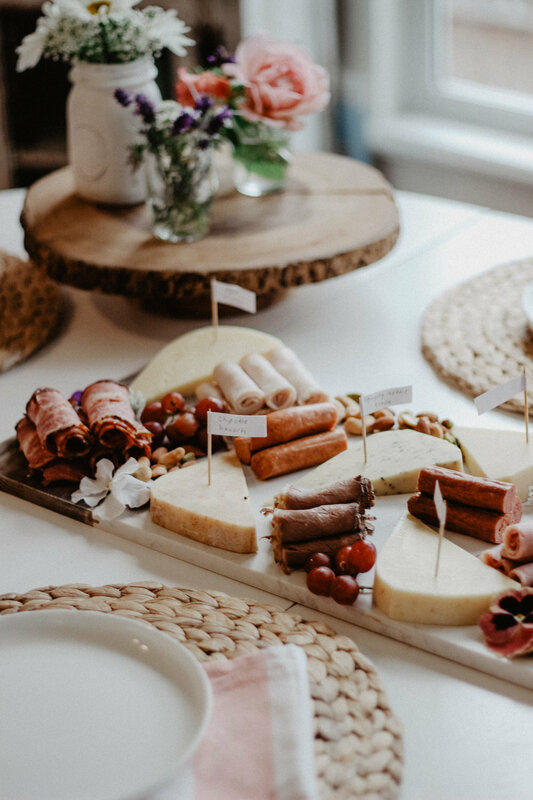 We paired our local meets and cheeses with two delicious local wines from Whispering Horse Winery , a local winery in Chilliwack that is family owned and operated. 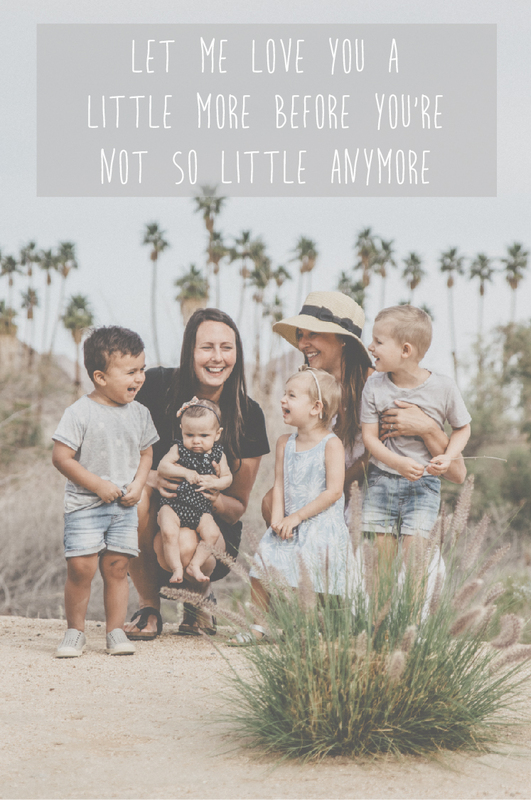 Melissa, one of the owners, is a mom as well and fully understands the meaning of the word "mom hustle". 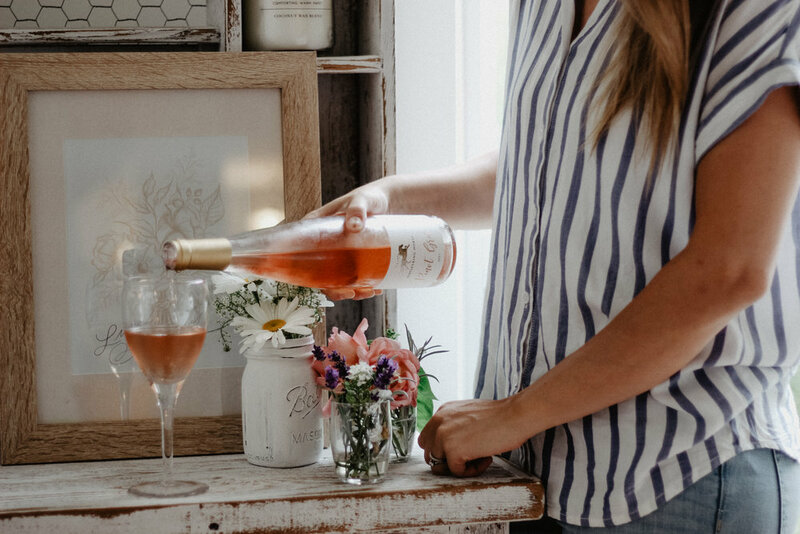 We love supporting local businesses and Whispering House Winery is one of the only wineries in the valley that uses 100% grapes grown directly from their vineyards. They offer two wines: Pinot Gris (my favourite) and L'Acadia which can both be purchased from their Winery (you can book a tasting on the weekend via their website) or at a few local places including Swirl Wine store in Yaletown, Village Wines in Kitsilano, Legacy Wine Store in Olympic Village, and Garrison Wine & Liquor Store in Chilliwack. 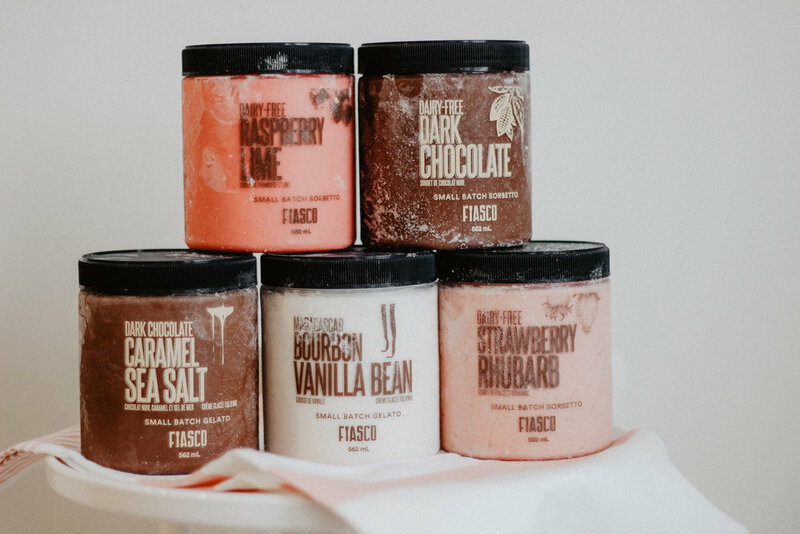 The perfect dessert to any summer evening is icecream, especially from this Canadian Company called, Fiasco. This ice-cream is Gluten-free, Dairy-Free, Vegan Friendly and Made in Canada. It was incredibly delicious! We were blown away by the Strawberry Rhubarb, Dairy Free Dark Chocolate, Dark Chocolate Caramel and the Raspberry Lime. Their containers are clear so you can see exactly what you are getting and they are recyclable. The best part, we picked up our tubs of ice-cream at our local Save-On-Foods and they were on sale - bonus! The ice cream has so much flavour and the texture is so smooth and creamy. We were so inspired after this local evening and was reminded that there are so many incredible Canadian companies. If we had one take away for you, it would be to find a local company in your area and try something new this summer!